A heavy duty, high quality portable oxygen/nitrous oxide delivery system that houses "E" cylinders (2 - 02 and 2- N20) and may be moved easily from operatory to operatory. 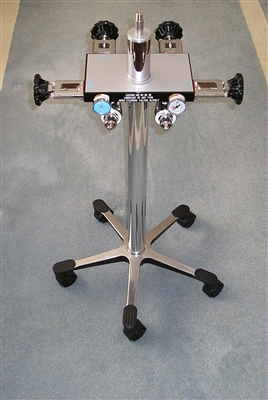 The manifold block is the backbone and supporting structure upon which the oxygen/nitrous oxide analgesia flowmeter rest. 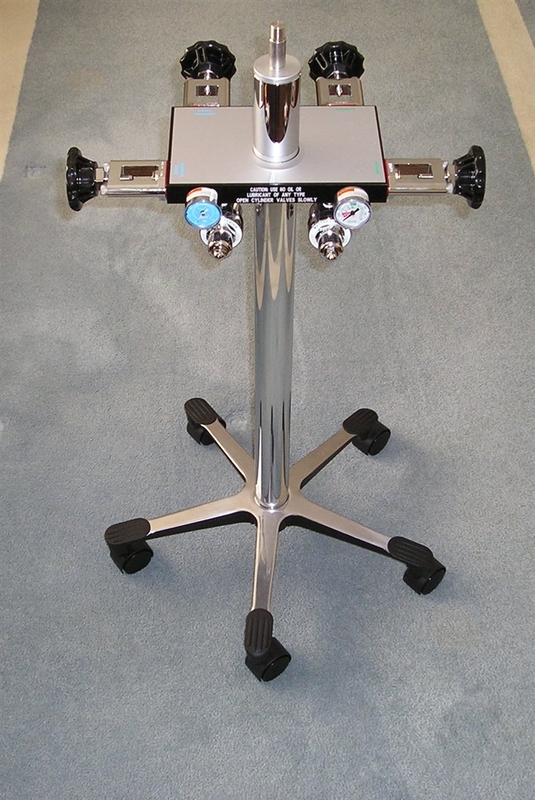 The manifold block is then mounted on a mobile stand. The "E" cylinders affix to the yokeswith easy to use large hand wheels, which are affixed to the manifold block. The "E" Yokes are designed with the pin index safety system to prevent placing the wrong gas cylinder on the wrong yoke. Content gauges show the current level of product in the tank(s) being used.